This proposal will support the NRCS Soil Health Initiative and other related nation-wide partnerships. The goal of this project is to further develop and adjust the CSHT decision tool to foster broader implementation, application, and use on a national scale. Where possible we would like to aggregate the datasets of the CSHT and Haney Test indicators and others to further refine or combine both test packages into a standardized soil health test. The Cornell comprehensive assessment will be expanded to include indicators and scoring function across a range of inherent soil properties, cropping systems, and climates for 5 regions of the United States (Northeast, Southeast, Midwest, Southwest, and West) and integrate other approaches currently being offered where appropriate. We will also examine the viability of a basic “starter” test as a simple alternative to the comprehensive test. A secondary goal is to develop guidelines on how soil health assessment and adoption of soil health practices can be used to adjust land values and reduce crop insurance premiums to reduce risk and incentivize use of soil health management practices. 4. Design an approach where the Soil Health Assessment Framework can be used for land value determination and risk reduction. Collaborators, please visit this page for special instructions. In order to contribute significant solutions to perpetual U.S. water quality and greenhouse gas emissions issues related to corn nitrogen management, this project demonstrated and advanced the use of precision N management by deriving fertilizer estimates from dynamic simulation modeling, combined with high-resolution climate data, and site specific soil and management information through use of the Adapt-N tool. Efforts focused on two general areas: (i) advancing adoption through in-person and online training of stakeholders, on-farm demonstration trials of grower-chosen vs. model-derived N rates, and evaluation, and (ii) enhancing the Adapt-N tool for wider geographical areas and broader sets of agronomic practices. The focus areas were New York and Iowa, with pilot efforts originally planned in Indiana and Pennsylvania. 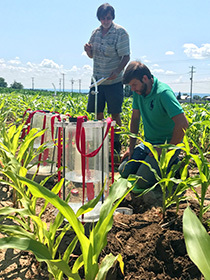 As part of this project, soil samples from research and commercial farms were analyzed using protocols for soil proteins (an indicator of the highest N-containing component of organic matter) and respiration (an indicator of microbial activity). These indicators are now included in the Comprehensive Assessment of Soil Health. One recommendation from this project was to assess the potential of soil health data, such as respiration and soil proteins, to refine N recommendations and highlight the impacts of diverse and divergent soil health status across farms on N dynamics. This project focused on three important objectives: 1) to beta-test the Adapt-N tool’s recommendations against current grower practices on northern New York State farms to assess whether the tool’s recommendations can increase grower profits and decrease unnecessary N inputs, and to expand education and on-farm implementation of the Adapt-N tool in northern New York, 2) to obtain nitrate leaching data in northern New York from research field with lysimeter plots to document the water quality benefits of using Adapt-N, 3) to enhance the precision of Adapt-N recommendations by incorporating further soil test information inputs related to soil health, particularly N mineralization and water dynamics, as well as information gained from on-farm use, into future versions of the tool. We found that – 1) In short: in drier years (2011-2012) Adapt-N decreased N applications in NY by 66lb/ac, increasing grower profits in 80% of cases (more with proper use of the updated tool) by $31/ac on average, with minimal yield reductions. In 2013 with very wet spring conditions, Adapt-N increased N inputs by 28lb/ac on average over grower rates, for a yield gain of 24 bu/ac on average, and a profit increase in 90% of trials, by $106/ac on average. 2014 seems to be in line with 2011-12, results as it was more or less a “normal” year. More data and analysis pending for 2014. 2) Drainage water samples collected from lysimeters indicated lower water quality impacts under Adapt-N management. More lysimeter samples were taken in 2014 and more are under way for 2015. Data gathering and analysis are still pending. 3) Development of two new service-lab protocols related to organic matter quality and microbial activity (soil protein content and respiration) was completed. These protocols have been moved into Cornell’s Nutrient Analysis Laboratory. All Adapt-N trial samples have been analyzed for these indicators. A beta soil health module for Adapt-N will be developed for testing in 2015. This activity was delayed in 2014 because Adapt-N was moved to the commercial version and work was done to develop the website interface and transitioning to commercial use. Module improvements within Adapt-N will be a priority in 2015.